Brief: First introduced in 1984, the Koss PortaPro has been a definitive staple of the portable headphones market for 25 years. They have survived through multiple model-line changes and their drivers have become the basis of the SportaPro and KSC55 street-style headphones and the KSC35/KSC50 clip-ons. A titanium-coated version of the PortaPro driver is also used by the KSC75, UR40, and KTXPro1. 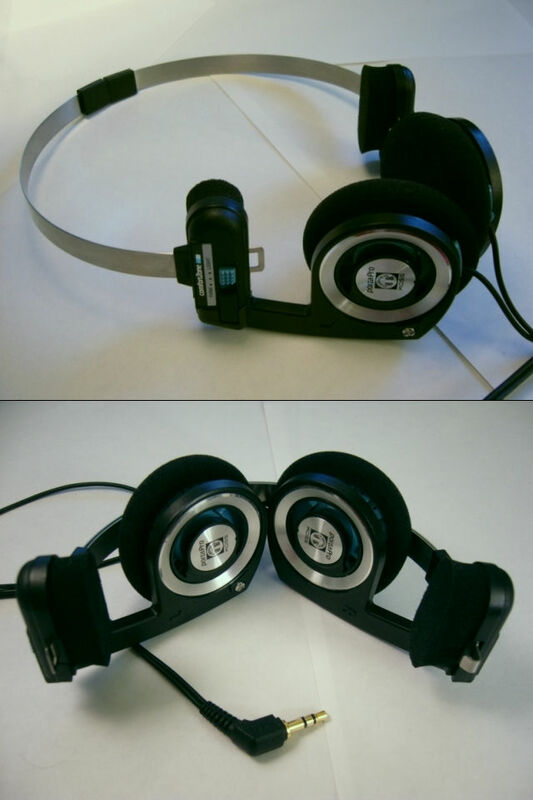 Build Quality (7/10): For 25-year old headphones, the design and build of these is very impressive. The folding mechanism is simple yet practical – there is only one hinge per side and it glides smoothly to lock into place. The headband is made of several strips of aluminum that slide over each other for adjustment. The PortaPros also look much better in person than they do in photos. The blue driver housings, for example, are barely visible from the side, and the metal accents on the cups look very contemporary. I personally prefer the look of these to the understated (read: boring) Sennheiser PX100s. The only area where more could be asked of Koss is the cheap feel of the plastics and the flimsy comfort zone switch. On the upside, these phones are covered by Koss’s no-questions-asked lifetime warranty just like the KSC75s. Comfort (9/10): While I personally prefer the fit of the PX100s, differences are minute between these two. The PortaPros differentiate themselves by having a ComfortZone switch on each side of the headband. The three comfort settings (that’s two more than any of the other headphones here) transfer clamping force between the earpads and the soft temple pads on the headband right above the cups. In addition, the PortaPros’ earcups are attached to the construction using ball joints, which gives them a good amount of rotational freedom, similar to the PX100s. The headband is also adjustable in a unique way – the PortaPros are best put on with the headband at its longest and then adjusted to the perfect length. The sliding headband length adjuster can latch onto one’s hair, which is both painful and annoying. Isolation (3/10): Not much different from the PX100s here, either – the PortaPros are quite open and very susceptible to outside noise. Sound (6.75/10): Those familiar with the KSC75 will instantly note a familial resemblance between the two headphones. The high-end sparkle of the KSC75 is gone but the bass of the PortaPros is better-controlled and deeper. It’s still somewhat muddy compared to higher-end headphones, but it gives the sound a warm fullness that few of the other sub-$50 headphones I’ve tried here can match. The mids are very similar to those of the KSC75s – fun, forward, and aggressive. The bass occasionally creeps up on the lower midrange a bit. The highs are slightly rolled off, which makes the PortaPros less tiring than the KSC75s for prolonged exposure. They are also very forgiving of mediocre sources and recordings. When compared head-to-head with their arch-nemesis, the Sennheiser PX100s, the PortaPros sound more exciting, forward, and aggressive. They have deeper and more copious bass. The PX100s are darker-sounding, have tighter bass, and are smoother overall. I find them to be slightly more natural/neutral than the Koss phones. They also have better clarity and more resolving treble. Value (9/10): Not surprisingly, these are in the same boat as the PX100’s value-wise as well. Similarly priced, they are easily worth the asking price and are sure the feed the bass-loving demons in all of us. As for the eternal rivalry between these and the younger Sennheisers, it comes down to personal preference in the end. I will admit that I prefer the Sennheisers, but I love the PortaPros for the uncompromising retro-throwback design and sound that somehow feels like it would have been right at home in the 80s. Yes. The KSC75 drivers are similar to the Portapro, but they are not identical. With both models, its like getting 4 different combos that do sound a little different from each other. There is point in buying both the KSC75 and portapro – because both are interchangeable with each other. So you can wear clips nad headbands with either the KSC75 or portapro drivers. I *just* made this wonderful discovery recently. I’ve had both for years and been annoyed with the headband of the portapro sometimes. The portapro drivers do sound a little different not being pressured against my ears, but not worse. It’s a nice option. The headband definitely keeps things in place better, but the clips are much less of a presence. So there’s little point in purchasing the PortaPro instead of the KSC75 unless one finds clip-ons uncomfortable? A $30 price increase for a half point improvement in sound does not seem like a good deal. Do portable headphones with significantly better sound not exist? The PortaPro and KSC75 use very similar drivers and sound similar, as expected. There are of course better-sounding portable headphones and earphones, but they cost more as well.